As you are going north on the Harlem River between the Bronx and Manhattan, the University Heights Bridge is the tenth in a series of eleven that includes the Willis Avenue Bridge, 3rd Avenue Bridge, Metro-North railroad bridge, Madison Avenue Bridge, 145th Street Bridge, Macombs Dam Bridge, High Bridge, Alexander Hamilton Bridge, Washington Bridge, University Heights and Broadway Bridges. Just as Ole Singstad is NYC’s unsung tunnel builder — he engineered the Lincoln and Brooklyn-Battery Tunnels and had a large hand in the Holland Tunnel — Alfred Pancoast Boller is NYC’s unsung bridge builder. 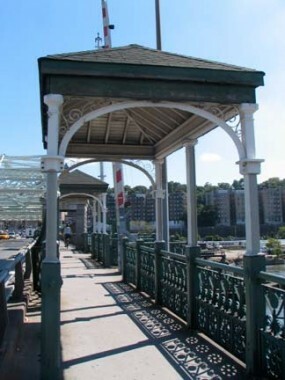 Boller designed the Madison Avenue, 145th Street, University Heights and Macombs Dam swing spans over the Harlem, and when you view them, they are all of the same swing bridge template — all versions of the same bridge. This sin’t a bad thing, since in Boller’s era, attractiveness in bridges and public works ranked equally to their usefulness. Boller’s wikipedia entry is short, but brimming with NYC history. Alfred Pancoast Boller (February 23, 1840 – December 9, 1912) was a civil engineer and bridge designer. He was the chief engineer on several bridge building projects during the late 1800 and neary 1900s. Born in Philadelphia, Pennsylvania in the United States, Boller graduated from the University of Pennsylvania in Philadelphia and from Rensselaer Polytechnic Institute in Troy,New York. He co-founded an engineering company, Boller & Hodge, that was based in New York City. Boller designed the third Market Street Bridge in Williamsport, Pennsylvania, the Madison Avenue and University Heights Bridges in New York City and the Connecticut River Bridge in Connecticut. He was also the chief engineer of Manhattan‘s elevated railroads. That last is tossed off as if inconsequential. But from the late 1800s into the 1940s the elevated was Manhattan’s aorta, bringing human traffic along 1st, 2nd, 3rd, 6th and 9th Avenues to workplaces and businesses nearly the length of the borough, until the LaGuardia era when the Independent Subway was built and els became inesthetic and were duly ripped down. 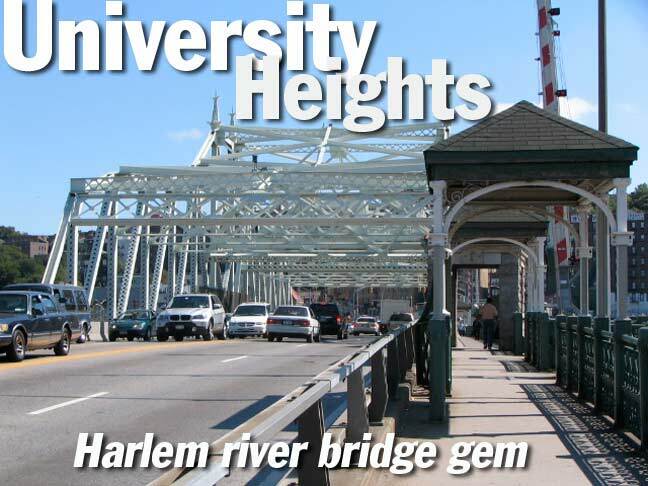 The University Heights Bridge is named for the Bronx neighborhood at its eastern end and runs from West 207th in Inwood to Fordham Road. 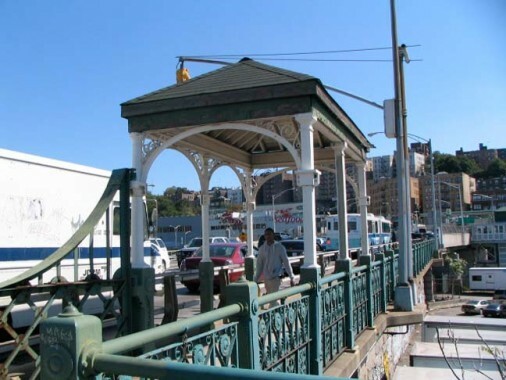 As such it is a direct connector to Pelham Parkway, Pelham Bay Park and the Hutchinson River Parkway. It was not built in the place it originally occupied — at first, it brought traffic over the Harlem River Ship Canal, connecting the Broadways of Manhattan and the Bronx. 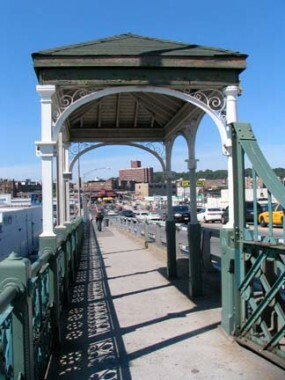 In the early part of the 19 Aughts it was decided to build a double decked swing span over Broadway to accommodate the new elevated, and so the old Broadway Bridge was floated down the Harlem to its current location in 1906. 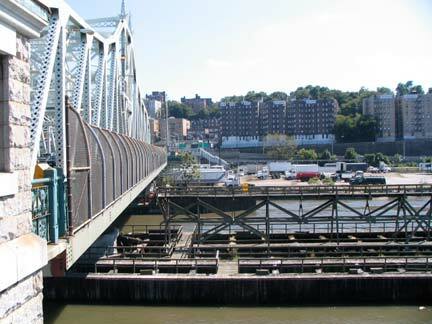 The newly Christened University Heights Bridge replaced a wood footbridge that had been in place since 1881 and removed in 1895, when the Ship Canal made the Harlem River navigable all the way to the Hudson River. 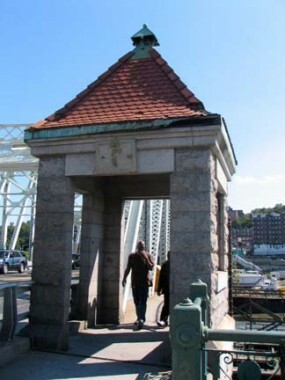 After additional steel and electric work, the bridge reopened in 1908. 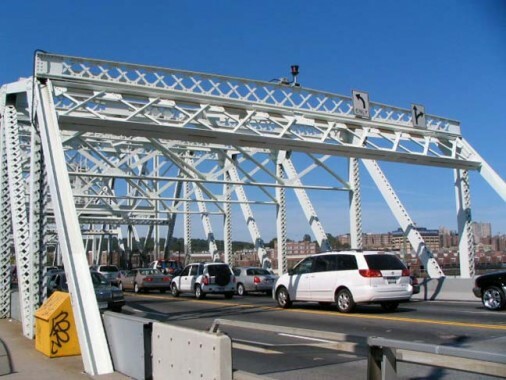 The rim-bearing swing bridge is comprised of two continuous trusses supported by a drum girder at the center, and toggle end lifts at the end piers. A floor system at the level of the bottom chords supports a 33-foot-wide roadway, which provides three traffic lanes (two peak-direction, one off-peak direction) between the two trusses. A six-foot-wide sidewalk runs along the southern truss. The 267-foot-long swing span provides two 100-foot-wide navigable channels and a vertical clearance of 25 feet. 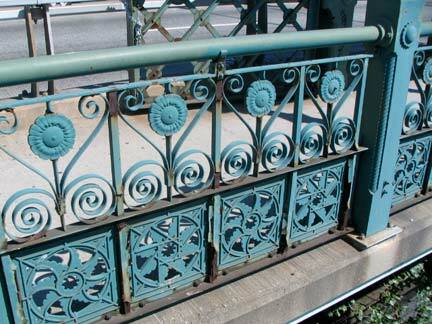 The University Heights Bridge is a creature of the Beaux Arts era and contains fillips and gewgaws such as the presence of a pair of covered shelters, the purpose of which seemed to be the protection of bustle-clad ladies with their parasols relief from the burning sun. 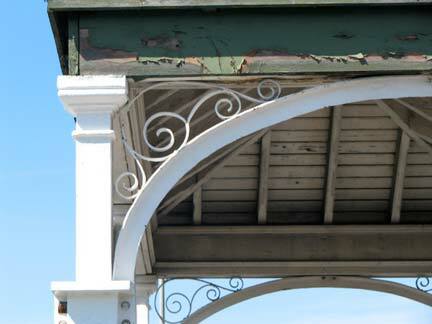 If included today such a shelter wouldn’t include the curved wrought-iron work the 1903 University Heights Bridge does. The purpose of these peaked stone structures on Boller’s bridges is unclear. At one time tolls may have been taken, and these were the booths. The neighborhoods the bridge connects can be charitably called rough and tumble, especially on the Manhattan side with chop shops and abandoned boat slips and marinas. Boller’s daisy and cart wheel design is especially anachronistic. Perhaps yuppies will someday gentrify, and sip their lattes under the sun shelters. “…floated down the Harlem to its current location in 2006” I think you mean 1906 or 1907. Otherwise, loving this site as always. Keep up the great work! The University Heights Bridge was moved in 1906 NOT 2006! A common mnemonic error. Fixed it, thanks. As the picture at the top of the page shows, it’s a four lane road now: two lanes in each direction, regardless of the time of day, though the lanes are quite narrow. The lights are still up from the days when it was three lanes, but I’ve been taking the bus across the bridge several times a week for nearly five years and it’s always been four. You actually make it appear really easy along with your presentation but I find this topic to be really one thing that I feel I’d never understand. It kind of feels too complicated and very large for me. I’m taking a look ahead on your next put up, I will attempt to get the hold of it! 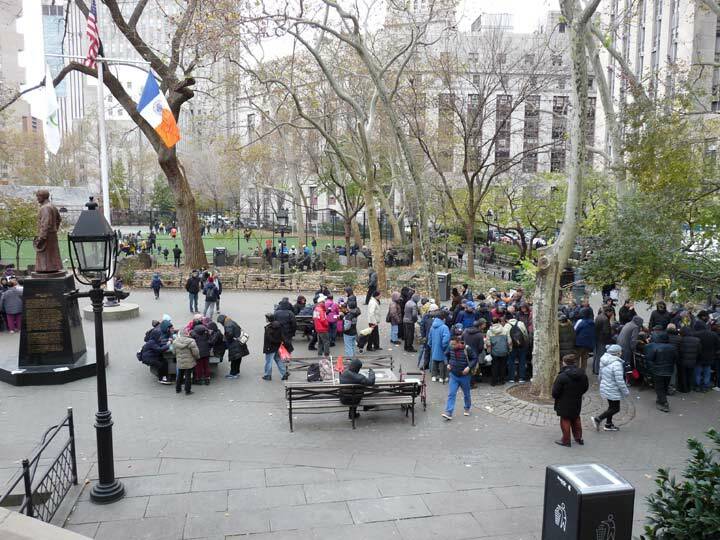 Another great article in an absolutely great series of stories about New York! If you like Bronx history you might check out ” The Story of The Bronx” from the early 1900’s. It can be found in the reference sections of New York libraries. Does this swing bridge still operate today? Great article! But I’m a bit confused – you write that it was not built in the place it originally occupied. So when and where was it built, when was it moved to The Broadway Bridge location, and how long was it there before it was moved to its current location?